The Aston martin Vanquish, the Ultimate Grand Tourer- now enhanced in a distinctive monochrome special edition. Vanquish carbon Edition expresses beauty and soaring performance both with extraordinary confidence, embracing its dark side with a fascinating theme and enriched with a unique package of carbon fiber and styled dark features. Assertive and sophisticated, Vanquish Carbon enhances the exterior and interior styling of our flagship with expertly crafted detailing coming from the most advanced carbon fiber and the finest materials. The heart of Vanquish Carbon edition is the latest version of our iconic 6.0 liter V12 masterpiece- AM29. Sophisticated new engine management frees even more power, working seamlessly with the new 8-speed Touchtronic III automatic gearbox. This new lighter, faster gearbox executes gearshifts with greater precision, and with 568 bhp to draw upon, now the Vanquish carbon hits 0-100 kmph in just 3.7 seconds and a top speed of 323 Kmph. Striking new features as standard for both carbon Black and Carbon White edition define the car’s depth of character in meticulous detail. The New Vanquish Carbon special edition are sporting black side window surrounds, enforcing the uniquely assertive characteristics of our ultimate grand tourer. The distinctive 10-spoke gloss black non DT allow wheels complement perfectly the menacing styling of Vanquish Carbon black and purposeful carbon white. All new black headlight eyebrows, convey a determined and sinister look in this new subtle detail that not only defines, but actively enhances the unique essence of vanquish Carbon Black. Intensely focussed but inherently refined, the interior space of carbon black reflects the Vanquish’s unique and compelling breath of ability.black rotary dial controls rest elegantly against the assertive herringbone carbon fiber facial backdrop. The silken black Anodised speaker grilles of the Bang & Olufsen audio system and machinder carbon fiber sill plaques provide additional design touches. all perfectly integrated into a captivating interior experience. 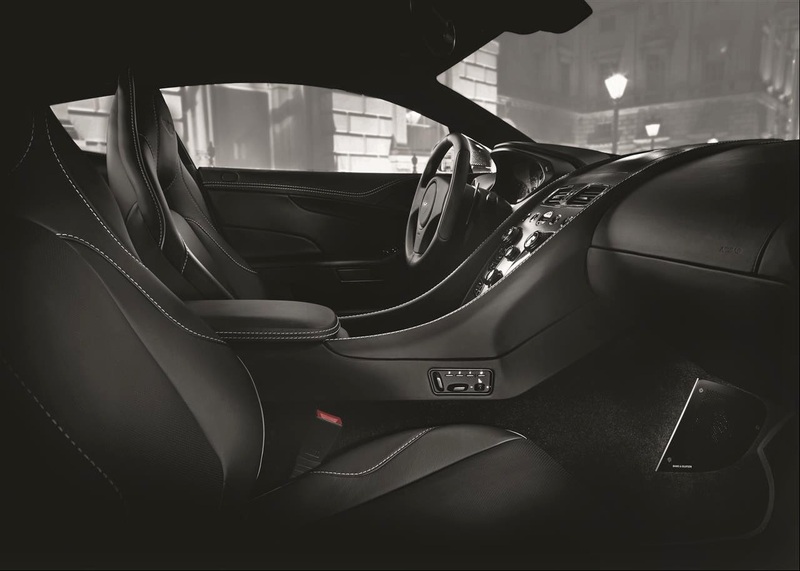 And it offers optional quilted leather seating and door inserts, providing a unique textured visual effact for driver and passenger, matched and further enhancing the luxurious feel of the beautifully indulgent interior.